19th May 2016 a special day for the State. The 15th Assembly election results came out today. Tamil Nadu Chief Minister Ms. J. Jayalalithaa’s All India Anna Dravida Munnetra Kazhagam (AIADMK) has prove exit polls wrong ! For a state that has not returned a sitting government to power in the last 27 years, the numbers hinted at Tamil Nadu making history this time around. The three-time Chief Minister becomes the first person after MGR to be elected to two contiguous terms. Making a victory speech outside her Poes Garden residence, she thanked the voters for choosing her party and vowed to work for the welfare of the people of Tamil Nadu. This is no post on TN Elections, Amma win and party celebrating ! How much do you like ‘the Nation wants to know’ – a person, perhaps most memed, not so much liked by many, the person who vents the nation’s anger from 9 pm onwards, every day. Many have criticised him as having mastered the art of interruption – and this post is all about the silence, regard, poise, self-confidence, political decency and more of the interview @ 8 pm on Times Now a few minutes ago. Arnab Goswami, is no doubt popular, the editor-in-chief of Times Now and ET Now. The Newshour, a live debate anchored by him, is aired at 9 pm (IST) weekdays on Times Now. Arnab hails from Guwahati, Assam from a family of eminent jurists. I loved watching his show @ 8 pm not necessarily because he marvelled at the decimation of Congress in Assam, but more because of the poise, glamour and respectability of the show and how the participants behaved – a real object lesson. Only in film [Shankar’s Muthalvan] – one can throw questions at a CM. Today it was the old gentleman. All exit polls had already shown him the door but Assam Chief Minister Tarun Gogoi, ensconced was so confident of returning to power said that “for the last two-three days, I have even stopped taking my blood pressure pills”. At 8 pm, Arnab had Mr Tarun Gogoi and Mr Himanta Biswa Sharma on the show, stating that he knows both of them for ages, but never had them together on show, they in recent past were so much together. First full credit to Mr Gogoi. Tarun Gogoi has served as the Chief Minister of Assam since 2001 having led Congress party to a record three consecutive electoral victories in Assam. He completed 15 consecutive years as Chief Minister of Assam yesterday !!! Gogoi was born in 1934 into an ethnic Assamese Tai-Ahom family at Rangajan Tea Estate. Gogoi has served six terms as a Member of Parliament (MP) from the Lok Sabha. He first represented Jorhat in 1971–85. Later Gogoi was elected from Kaliabor; this seat is currently held by his son Gaurav Gogoi. Himanta Biswa Sarma has served as MLA from the Jalukbari constituency in Assam from 2001 till 2015. A former member of the Indian National Congress, Dr Sarma joined Bharatiya Janata Party only recently. Dr. Sarma’s Book “Samagat Samay” is reportedly one of the bestselling books in the literary history of Assam. His tenure as a health minister saw the establishment of Assam’s first medical university and the opening of three new medical colleges. Clearly they have parted ways [reportedly due to Gogoi promoting his son in the party !] – throughout the interview, Mr Gogoi remained poised, did not utter one single angry word, though, he directly did not greet his ex-protégé. When asked, he greeted the PM Mr Modi, the BJP party, the RSS cadre who said all worked together – though that direct greeting remained elusive, Mr Sarma kept smiling. When asked, Sarma, said, Gogoi and Congress in their previous reins had done good for the State and for sure would take the experience of Mr Gogoi who would be in the assembly. One cannot imagine a CM of our State to be on air in a TV show subjected to Qs by the Presenter and Panelists and much more so, to be seen with a leader of rival party [though the show did not have them sitting together in the same studio]. 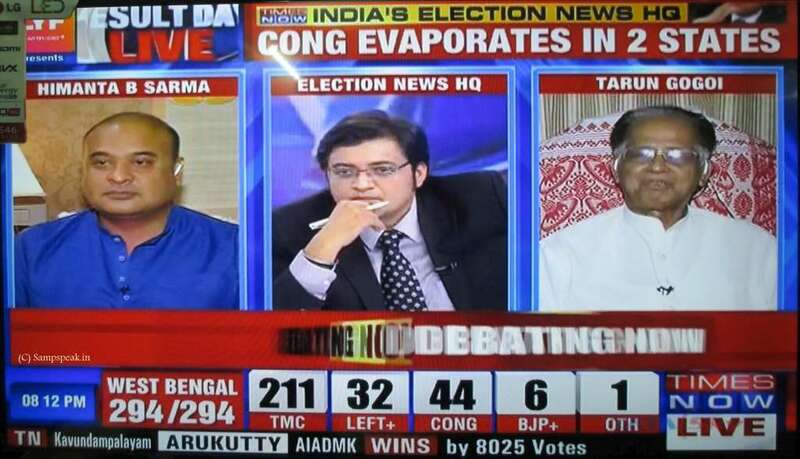 Arnab quietly recalled that during Parliament elections, he had Mr Gogoi on the same place for the show and when BJP were shown as on lead in 9 seats, he had hastened offer to resign. The Q of Arnab was – for a small victory in a municipal seat in Delhi too, the party would give the credit to Rahul Gandhi – and why would not they do so, for the loss. Gogoi quickly said, he would take all responsibility and not blame any leader, stating that the party picked candidates by a process. Arnab parried on dynasty, stating people are wary of ‘blue-blooded scions pushed into frame’. It certainly was a tough period for Gogoi to defend, he did well. Posing Qs to such a Senior politician, a CM, was done with poise by Arnab and .. and Himanta was all grace in his choice words, expressions, showing regards to his ex-mentor, not intervening at all. A great show – bow to Assam’s political culture and I have become a fan of shouting Arnab ! !